From the Baldwin County Courthouse, go west on Hancock St. which becomes Highway 49 and follow Highway 49 south for 8.5 miles from the Courthouse. Turn right on Lingold Road and go for 0.1 mile. Turn left on the driveway to the water tower. Go 100' to the water tower. The cemetery is located in front of the water tower. Farewell my wife and children all, From you a father Christ doth call. 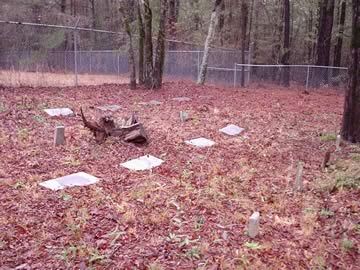 16 graves marked with granite pillows with no markings.